It is important to keep a water heater in good working condition. If you find some issues with your unit, you should call a professional technician to do the water heater repair, San Diego. A defective or malfunctioning water heater cannot just compromise your energy-saving, but can also pose danger to users. There is one name that is trusted by many homeowners to do water heater repair, San Diego – All American Plumbing, Inc. With decades of experience in the industry, our company has built (and continue to build) a long list of loyal customers in the area. We have provided homeowners in San Diego and the surrounding areas with prompt response to their water heater issues. Expert technician working. When a technician is an expert, you can rest assured that even small issue is found and fixed. The reason for this is that, aside from skills, this technician is equipped with sophisticated tools to perform the task with great precision. Safety is paramount. You cannot just entrust the repair job to a person who seems to have just popped out of nowhere. In doing a water heater repair, safety is paramount. A professional technician (who comes from a recognized water heater repair company) adheres to certain protocol or standards imposed by their company to ensure that the item repaired is safe for use. Insured and guaranteed service. A professional technician coming from a legit water heater repair company is insured, which means you are not held liable if an accident happens to him while working. Also, they provide a guaranteed service, which means, if some issues occur in the future, you can call them again to address or fix such issue, depending on the agreement you have. 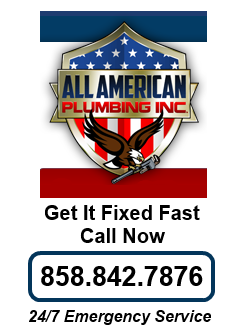 All American Plumbing, Inc. is the name you can call for water heater repair, San Diego. Our expert technicians are bonded, insured, and experienced to give you the best service that the industry can offer.